Our Managing Director Jordan Frizzell was awarded the 2017 Landscaping NZ Prebble Seeds “Young Landscaper of the Year” award, presented at the Landscaping New Zealand annual conference held at the The Sudima Hotel on Saturday 27th May. With a lifetime love of gardening, Jordan started his career as a landscaping apprentice at Bridgeford Landscapes while studying with HITO (Horticultural Industry Training Organisation), where he gained Certificates in Horticulture and an Advanced Certificate in Landscape Technology. After 15 years in the landscaping industry, Jordan decided it was time to enter the Young Landscaper of the Year competition and qualified for the finals in Auckland, where he was tested on both his academic knowledge and his practical landscaping skills. “It’s always been a goal of mine to enter the Young Landscaper of the Year, ever since I was a young apprentice. I know I left it late with this year being the last year I could have entered but it was worth it. 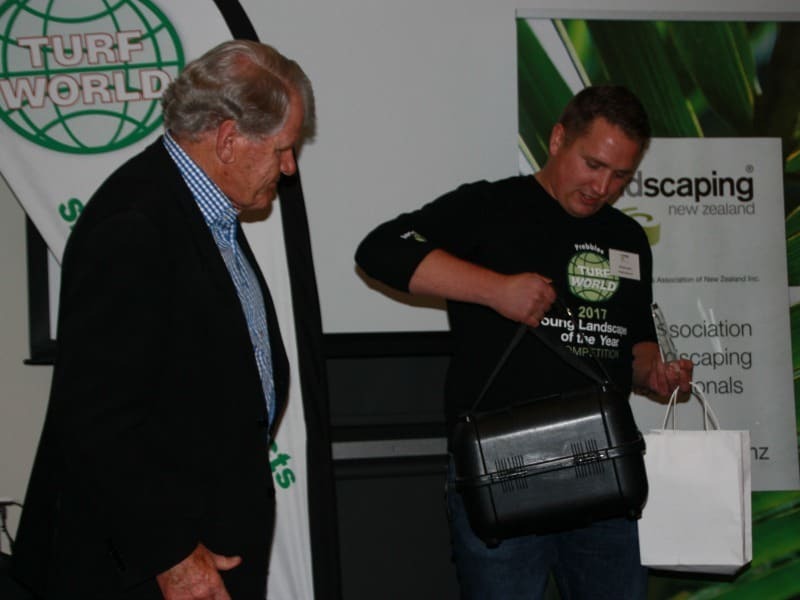 It was an amazing competition and there were some great landscapers competing” said Jordan after receiving his award. This year’s prize included a Vectorworks Landmark software licence, Husqvarna chainsaw, Prebble Seeds vouchers, Placemakers vouchers and a new laser level courtesy of Placemakers. Since establishing Outerspace Landscapes in Christchurch in 2006, Jordan and the team have created countless gorgeous gardens, from the hill suburbs to the rural Canterbury hinterland. The team are especially proud of their People’s Choice Award from the Ellerslie International Flower Show 2009. Busier than ever with the company’s recent expansion into Queenstown and Wanaka, Jordan is keen to maintain his winning form with several impressive landscaping projects currently underway.